As a follow-up to the presentation about the Morris Canal on May 14 (see “Coming Events”), we’re going to walk along the waterway’s route. Our leader will be Bob Barth, an enthusiast of New Jersey’s canals and a true advocate. Our 4.5- mile, round-trip trek will begin at the Delaware Canal guard lock. 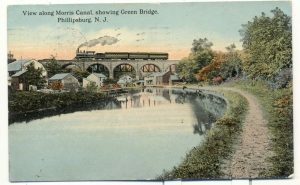 From this vantage point, the massive stone arch entryway to the Morris Canal can be spied across the Delaware River in Phillipsburg, NJ. We’ll then cross two bridges in Easton – the first over the Lehigh River, the second across the Delaware River into Phillipsburg. Activists are making great headway in developing the Morris Canal Greenway, an initiative to preserve the canal right-of-way, mark its route, and create trails and parks. In Phillipsburg, we will experience the fruits of those efforts. We’ll follow Main Street’s sidewalk to view the top of the stone arch entryway, then the route of the Belvidere Delaware Railroad will lead us to the sites of Port Delaware and Inclined Plane 11 West. Back on Main Street, we’ll come to Andover Iron Works and the Andover Hotel. Our turning point will be Greens Bridge, even though there is so much to explore on the Morris Canal. Next time. Meet at the Forks of the Delaware River Recreation Area, 210 South Delaware Avenue (Route 611), Easton, PA 18042. We’ll be back in time for you to attend a Canal Boat Ride and Dinner on the Lehigh Canal in Easton. Benefitting the D&R Canal Watch, this event includes a mule-drawn boat ride, a three-entrée buffet, and entertainment by Roy Justice. Best of all, the boat will lock through the Abbott Street Lock. To find out more about the ride and purchase tickets, visit canalwatch.org.